Army Sergeant Trevor Bishop joined the U.S. military because he wanted to be part of something bigger than himself. He also wanted to make a difference in the world by helping people. 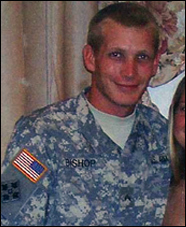 Sergeant Bishop was deployed to Iraq three times from 2005 to 2011. He suffered numerous injuries during his time in Iraq and has a 90% disability rating. Sergeant Bishop has been diagnosed with post traumatic stress disorder, degenerative disc disease, severe migraine headaches, traumatic brain injury with post concussion syndrome, serious injuries to both shoulders, and other injuries. Among the commendations awarded to Sergeant Bishop were the Iraq Campaign Medal with Five Campaign Stars, Army Commendation Medal (3rd award), Army Achievement Medal (3rd award), Meritorious Unit Commendation, Army Good Conduct Medal, National Defense Service Medal (2nd award), Global War on Terrorism Service Medal, Non-Commissioned Officer Professional Development Ribbon, Army Service Ribbon, Overseas Service Ribbon, Driver and Mechanic Badge with Driver-Wheeled Vehicle Clasp. Sergeant Bishop, his wife Jennifer and their three children were gifted a home in Surprise, Arizona in 2014.